On July 29, 1958, the 34th President of the United States, Dwight D. Eisenhower, signed into law the “National Aeronautics and Space Act of 1958” (Public Law 85-568). Less than one month later, President Eisenhower administered the oath of office to NASA’s first Administrator, T. Keith Glennan, and the agency’s Deputy Administrator, Hugh L. Dryden, who had been serving as the director of NASA’s predecessor, the National Advisory Committee for Aeronautics, or NACA. 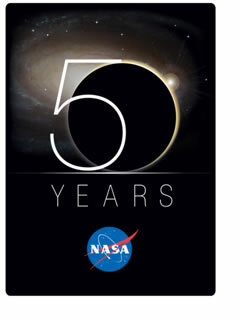 To commemorate NASA’s beginning, the agency has released an immersive multimedia experience that takes visitors on an interactive tour of its first five decades of exploration. Combining current and historic video with state-of-the-art computer animation, the virtual exhibit takes a World’s Fair approach to NASA history, featuring pavilions that host each decade of the agency’s challenges and achievements. Visitors will get unique insight into NASA’s activities over the years, including a wide range of exploration and research initiatives, and a glimpse into the future. Visitors to the site can also experience interior three-dimensional views of John Glenn’s Friendship 7 Mercury spacecraft, the original April 1959 press conference introducing the Mercury astronauts, a tour of the International Space Station, video presentations about NASA’s aeronautics programs, and an interview with former CBS news journalist Walter Cronkite.